Grip covers slip over your existing grips. Made of a special high tech material that is U.V. , ozone and oxidation resistant. Material will not weaken or crack as a result of years of outdoor exposure. Wall thickness is approximately .38cm. Grip Puppies fit OVER all standard grip sizes. The standard Grip Puppy will fit standard bars sizes and grips. They are 5" (12.7cm) long and will fit grips that are 1.25 (3.17cm) to 1.45 (3.68cm) inches in diameter. 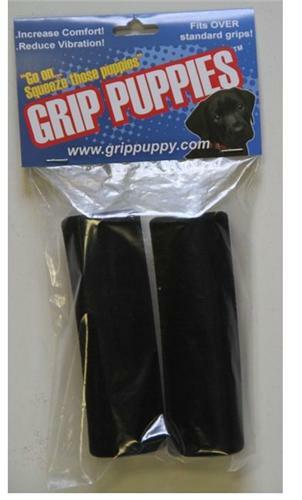 (remember these fit OVER your standard grips, you don't need to remove them) Grip Puppies can be trimmed to length with a craft knife or similar if needed (using appropriate care!) These are great for adding a little extra thickness and comfort to your grips. Will also work with heated grips. Reduce vibration.